A few days before the start our RBA (Regional Brevet Administrator) Rob H., told me we had 20 registered riders for the event. That was twice as many as the previous year. By June 14 we had 27 registered riders but after last minute changes to people's plans and new additions to the roster we had 25 starters. At 5:30 I meet Brad our Start Control volunteer at the parking lot in front of the Beach Hut Cafe in Crissy Field and slowly riders made their way to us to pick up their Brevet Cards. After a few comments on my part we left at 6:00am. Perfect weather. 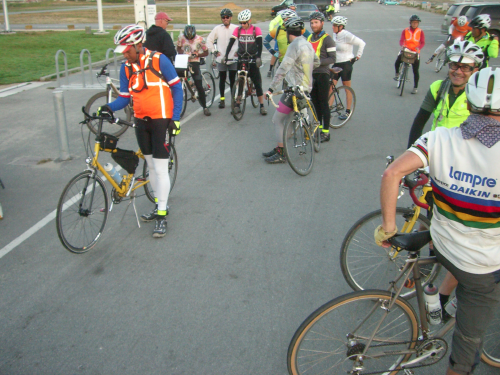 With such a large turnout, for this event, we split early into smaller groups and by the first descend into the Marin Headlands I was riding with John P. and a few riders I did not recognized. The first dirt part which is a narrow trail created a small congestion as faster off road descenders were blocked by slower riders new to mixed terrain group riding but after a few yards, things cleared out an we all felt onto our comfortable pace. Going up Miwok trail I heard heavy breathing behind me, when I turned around I saw Grant H. who was doing his first La Ruta and remind him this was a looong day with plenty of climbing, "take it easy and steady"
By the time we got to the first control our small group checked the answer to the Informational control and rolled down towards the valley. This segment has plenty of erosion control washboards that form steps on the trail and make it for very interesting riding. 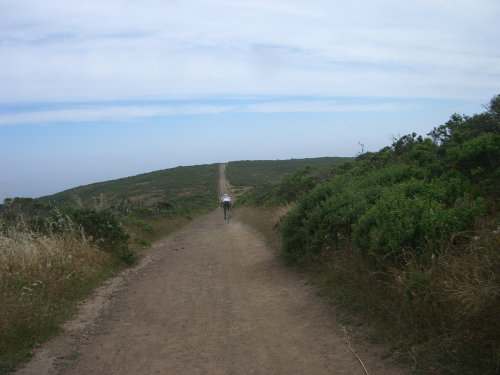 At the bottom, we all walked our bikes for a few yards as indicated by the sign at Tennessee Valley Stables and continued on to Coastal Trail, a mean short climb that further broke the group. I set on my pace and lost contact with the riders ahead but right after the descend into Muir Breach I caught up with John and Christon and rode with them to the next trailhead, the long hill up Deer Park. My comfortable pace saw them move ahead and I rode alone pass Pantoll Ranger Station and then Rock Springs Lagunitas trail. I was having a nice time and my progress was just ahead of what I had planed. Descending into Lake Lagunitas i saw Christon on the side of the fire road, "you OK?"... "yeah" I though it was a flat but later at the finish I learned it was a broken chain. Further down the road if was Geoff, again asked if he was ok, "yeah". By Lake Lagunitas I cough up again with John and further ahead was Jeremiah who was just mounting the bike after spending a good chunk of time fixing a chain stuck in the front derailleur. One more Informational control and one Ensure for me. John, Jeremiah I made it to Concrete Pipe @ BoFax together. Pavement for a little bit now. 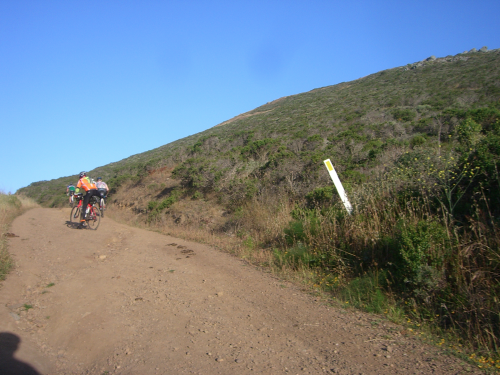 This is a part of the ride where in the past, I have had cramps going from Alpine Dam to the Bolinas Ridge trail head but today managed to get into a good slow rhythm and tired but without cramps got to the dirt. 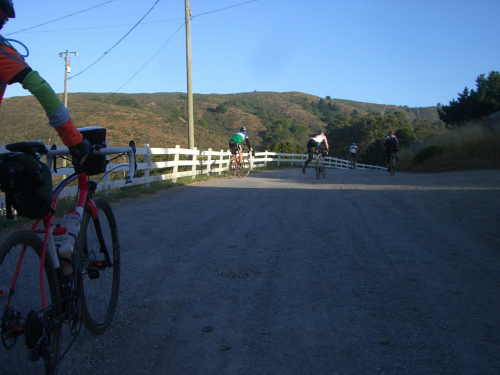 Such a fun fire road Bolinas Ridge. It fits my riding style nicely; I tried to move efficiently over roots, rocks and everything else. Did not see a single rider here. One more Informational control at Randall Trail @ Bolinas Ridge and quickly descended to Hwy 1 where smooth pavement awaited. Traffic on Hwy 1 was light, and I though I knew the reason, the World Cup. The Colombian team was on my head and they had probably just finished their opening game against Greece. What the score was? Entertained by my own World Cup speculation I got to Point Reyes Station fast. At Whale of a Deli ordered my usual greasy pepperoni pizza slice and asked the cashier what the score was. Cashier: "Si te digo the pones bravo"
Cashier: "No, bailaron a Grecia. 3-0"
There is a lot of rooting and sympathy among Latin Americans for Uno de los Nuestros (One of Ours) and yes Brazil is considered part of that. Anyhow we tend to celebrate and suffer together when it comes to the World Cup. My home country team apparently had played a very good game and won 3-0. Yeah that put some little extra fuel in my tank. Now with a happy stomach and heart I was on the road to the next control just outside town. When I designed the route I made this an Information control so riders would not need to chase the clock to meet the closing time. On the way to the control I pulled my Brevet Card and read the question, without stopping got the answer and set again on a comfortable pace for the longest paved stretch of the route. On Fairfax I wanted to have something else to drink and stopped at the Java Hut for an iced coffee which went straight into my water bottle. the whole stop was very fast. I think I saw familiar faces at the Iron Springs Pub outside tables but I could not socialize and stop for a burger and beer as usual. On to Tiburon. Entering Tiburon the road was closed by a classic car show and cyclist had the choice of either walk the bike a few blocks and see the show or use a detour. I took the detour that send me a block past the Cafe Acri which was a receipt control. Once inside it took a loooong time to order as the line was long and people were not sure what to eat and took their time making up their minds while ordering (not before as my common sense advice me) but eventually I got some gelato and a big oatmeal cookie. I think for next year I'll scout a couple of alternate locations for a receipt control near by. Also confirmed Colombia's World Cup game score with the cashiers. Yup they had indeed won. A little bost to my energy right before Mt Tam. The gelato/cookie combo was perfect. Once I shovel that into my face I continued the ride. I caught up with John when crossing over Hwy 101. I have no idea where he passed me but probably when I went for coffee in Fairfax or when I stopped earlier for lunch in Point Reyes Station. I slowly rode pass him and soon got to the bottom of Railroad Grade the next off road segment where I drank my second Ensure for the day. Slow crawling up, or at least if felt like that till the water spigot about half way to the West Point Inn. John came while I was there and then he rode just a few yards ahead of me. We were tired. Another Information control at the West Point Inn. We started descending into Pantoll at the same time. By Panoramic Hwy I was just ahead of him and we passed each other several times on the way to the Marin Headlands last dirt section. On Coastal I descended faster and lost track of him. The afternoon was great, a little hazy but a very pleasant mild temperature. I had a clear view of the Headlands over the ocean. Beautiful landscape, being so near to completing this ride always makes me appreciate it more. Told myself to be careful not to crash while taking photos with one hand while descending a steep section. Ah, almost there! Marincello fire road. Time for more bicycle glorified junk food and climb steady to the top of this hill. One more question for one more Informational control, again reading the question on the card and getting the answer without stopping. A little bump and a nice descend into Bunker Road. I was wondering were was John. I could not have been that much faster as we both were hurting last time we exchanged 'how you feeling?" But climbing from the valley floor to Conzelman I looked down and back and did not see him. The last freaking hill! I am doing OK time wise but I am tired compared to last year. A celebratory photo opportunity when approaching the pavement of Conzelman and then another photo with the Golden Gate Bridge on the background. I always get watery eyes when finishing this ride. To me there is a strong sense of relief and accomplishment that I get when I start seeing the Pacific Ocean down from the top of the Marin Headlands hills and then when looking down at the Golden Gate Bridge from Coastal Trail @ Conzelman Rd. Bicycle traffic on the bridge was not bad and I flew across. No tourist hunting local bike riders today, all safe. 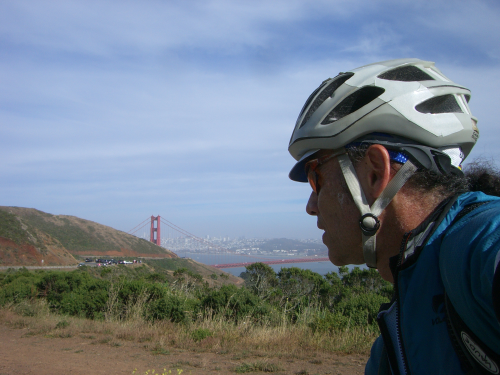 I was looking forward to the tailwind on the trail in Crissy Field and the wind did not disappoint. Barely any people on the wide trail allowed me to ride the last mile and some really fast, I could feel the rear wheel lifting off the ground on little bumps, I was going fast. At 5:54pm I was in front of Chris E. and Rob H. who were working the final control. 11:54hrs one minute faster than my own personal best of last year. I was happy and tired and knew riders had been cursing me all day, heck I had been cursing myself on some stretches, ha, ha. Viva La Ruta! Little by little other finishing riders keep coming in and also some riders who had decided to cut their ride short at different locations. Roland came in and call me El Diablo confirming my suspicions, people have had a good day on the bike. We had 15 finishers this time, 5 more than last year, that is progress. Thanks to all riders and volunteers. Here are the results for this event.